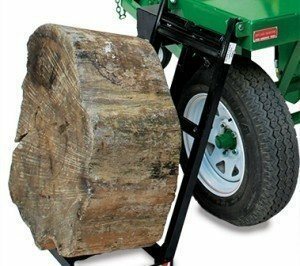 Why hire a Log Splitter from us? Built in safety – your hands stay away from the dangerous bit. Makes the heaviest job easy and safe. We buy the best machines available for your job. Your hands stay safely out of the way. All inclusive rates here online. No added extras. Ever. Quick cycle times and they’ll split anything. What’s the log splitter hire price? Our log splitter hire cost is fair for both you and us. Weekend Rate – the hire rate where the log splitter is collected on Saturday morning and returned by 7.30 am Monday. Watch a video so see how easy our log splitter is to use. (Turn your sound off if you’re at work – we forgot to remove the noise). Split your winter firewood with powerful hydraulic log splitter hire complete with lifting table. This log splitter will split commercial quantities of firewood easily, quickly and safely. Log splitter hire with built in safety. A Log splitter can be dangerous. Dual Hand Controls: keeps BOTH hands away from the dangerous bit of the log splitter so you will still have all your fingers at the end of the hire. 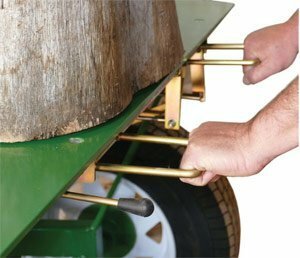 You can only make the splitter head move having a hand on each handle – ie away from the log and splitter. 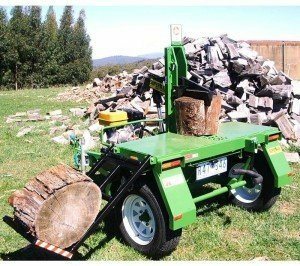 Horizontal Log Splitter Hire: We do not hire this type of log splitter as when we did we saw some customers come back with bits of their fingers missing. We think your fingers are way more important than the little bit of extra speed they give. Towable log splitter – light weight so your car will tow it easily. Powerful 20 tonne hydraulics – a log splitter for the hardest firewood. How safe is a log splitter to use? Our log splitter hire has built in safety. Hydraulic arm for lifting up to 200kg fire wood to save your back. Duel hand controls to keep your fingers on your hand. Most of our log splitter hire is to the same people each year who make it a yearly job. After all, winter comes around yearly so the need for a log splitter presents itself on the same interval. The “busy” time of the year starts in January as the well prepared hire a log splitter on a cool day knowing there’s another few months of hot weather to dry out their logs. The longer the wood can sit after being split the better it will burn. And if you’re a commercial operator – or just like collecting machinery – and want to buy a log splitter we buy all ours from superaxe.